After graduating from the Shepherd School of Music at Rice University in 1982, I went to London to study with William Pleeth, and in the process of looking for a place to stay, I found a house with flats that were rented only to international music students. A wall separated my flat from José’s and we soon got together to fix meals or order takeout. 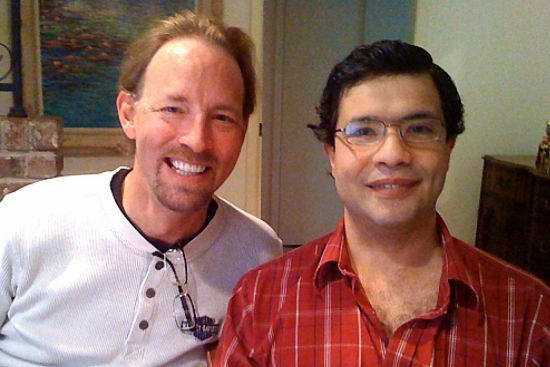 More importantly, José began to accompany me at my lessons where we both learned the cello repertoire at the same time, producing music so cohesive that we almost became one when we played. Two years passed since I left London and, in June of 1985, José was in the finals of the Van Cliburn International Piano Competition in Fort Worth, Texas, my home town. I was living in Houston and getting ready to move to my new job with the Honolulu Symphony, so I went home to Fort Worth to hear the rest of the competition. We were sitting together at the awards ceremony and I will never forget when it came down to two people, one of whom was José. The next name called wasn’t his, so José took the Gold Medal! 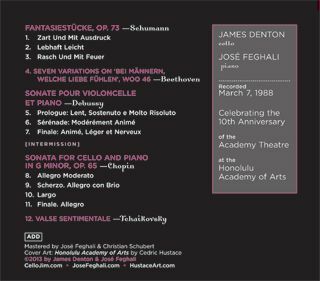 After winning the Cliburn, José did a lot of domestic as well as international touring, and in the spring of 1988, he was a guest artist with the Honolulu Symphony. It was my last season there because I had won an opening in the Houston Symphony. We decided to play a recital together as a farewell gesture to all my friends and colleagues. The venue was the Academy Theatre at the Honolulu Academy of Arts. This CD is the result of that recital. José went on to become Artist-in-Residence at T.C.U. in Fort Worth, so over the years since 1988 when I moved back to Houston, he and I see each other every time I visit my mother or on occasions when he has judged competitions in Houston or just visited. He was my houseguest on the morning of 9/11 and we watched that unforgettable day together. We’ve also spent many a Thanksgiving or Christmas sharing good food and better memories. In November of 2014, José had just spent Thanksgiving with my mother though I couldn’t be there due to the Houston Symphony schedule. He had called me on the Monday following Thanksgiving and we talked about whether or not he would be in Fort Worth for the Christmas holidays. He usually went to Rio de Janeiro to be with his mother since his brother had committed suicide a few years previously. If he was staying in Fort Worth, then I would stay with him. That’s the way it was with us. Since my mother had moved into a progressive living center and lived in an efficiency, she didn’t have room for me and a guest room where she lived was very expensive. He sounded wonderful and had really enjoyed Thanksgiving. I called him on December 9th to find out if he had made up his mind regarding his travel plans. My call went to voicemail, so I texted him as well. As it turned out, this was all in vain because earlier that very same day, José had laid down on his bed and taken his life with a gunshot to the head, just 3 days shy of the first anniversary of this album. I can’t begin to describe the emotions I have felt since I lost my best friend of 32 years. The TCU School of Music gave a Memorial Concert honoring José on January 25th, 2015, and they very graciously asked me to play on that concert. I chose Bach’s Prélude from the Cello Suite No. 1 in G Major, BWV 1007 for Jose at TCU's Ed Landreth Auditorium. And now, I offer this CD to you as a token of our 32 year friendship. It is a live recording, so there are mistakes we could not edit out, as one would in the recording studio, but José was also a recording engineer and he did a fantastic job of mastering. The fact that it is a live recording is what makes it so special to us — its humanity. It was recorded by amateurs on amateur equipment and was never meant for public consumption; however, on the 25th anniversary of this recital, we released it to the public and I would like to continue to share it with you in José’s memory. Please enjoy! 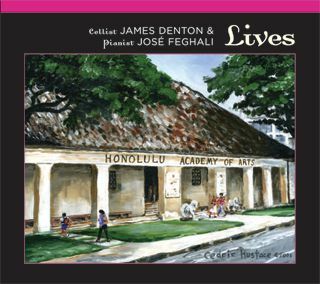 Click here to buy "Lives" now!